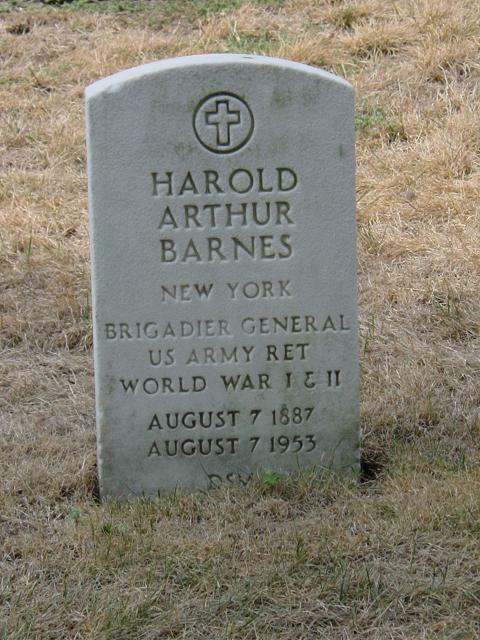 Harold Arthur Barnes (1887-1953). Born in Oneida, New York on August 7, 1887. Enlisted service with 74th Company, Coast Artillery Corps 1908-1917. Commissioned in the Quartermaster Corps in 1917. Executive to the Quartermaster General for Civilian Personnel Affairs December 1940-April 1942. Chief of the Organized Planning and Control Division April 1942-March 1943. Brigadier General in April 1943. Deputy Quartermaster General March 1943 until retirement in February 1946 as Colonel. Brigadier General on the retired list in June 1948. Decorations included the Distinguished Service Medal. Died on August 7, 1953.